Good news, folks – I replayed GoldenEye, and it’s still great. But twenty years ago we weren’t expecting anything from GoldenEye. As much as it is now revered as a platinum-coated classic, Rare’s stealth-’em-up appropriately came out of nowhere. Hopes were not high for a movie license, yet Rare and Nintendo’s magic created a game that defined console shooters for a generation. 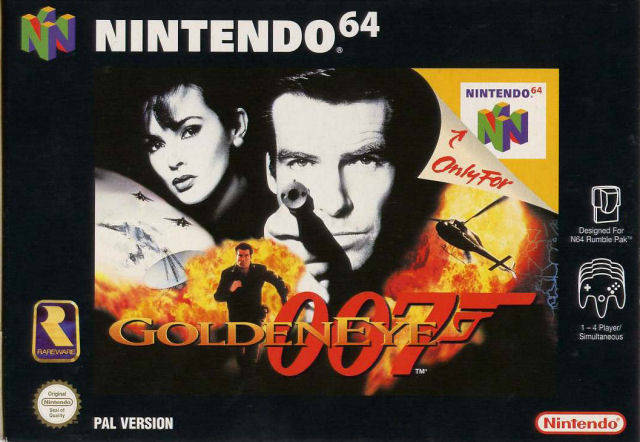 The genius of GoldenEye was in putting you in James Bond’s tux, handing you a silenced PPK and a range of mini-sandboxes in which to use it. This is a Bond simulator, not a video game straining to be a Bond movie. ← No Politics in Video Games? It may have been surpassed in the twenty years since its release, but Goldeneye remains a fun game to play. I still say one of my greatest gaming accomplishments was when I beat that insanely frustrating Aztec level on 00 Agent mode. Kudos to you Red Metal! I remember making it as far as beating Cradle on 00 Agent, but I don’t think I ever completed the Aztec or Temple extra missions! And the multiplayer is insanely fun. I also love the Time Splitters games they did after Goldeneye. Yes! TimeSplitters 2 on the GameCube was a solid follow-up by the ex-Rare folks, we played a lot of the multiplayer mode. I’m currently re-playing now too. But I’m stuck on the level: “Control” Natalya keeps dying haha. Yeah, I think I hated that level more than Cradle, only because of that bit trying to protect Natalya from the incoming guards!